The brake pad wear sensor is a simple component that plays a critical role in vehicle safety, and thus it should not be ignored, says ELTA Automotive. There are numerous factors that affect how quickly brake pads wear. Variables such as driving style, road conditions, what kind of roads are generally used and at what speeds they are travelled, as well as pad and disc compounds, all make it difficult to predict the lifespan of the brake pad. What is well known, however, is that below a certain level of wear, the effectiveness of the pads, and subsequently the whole braking system, reduces significantly. The challenge faced by vehicle manufacturers is how to alert the driver once brake pads reach this point. The most basic form of brake pad level indication is a groove cut into the profile of the friction compound. Once the groove is no longer visible, the pads are due for replacement. This of course involves a visual inspection, so is not ideal from the driver’s perspective. Another simple form of indication involves embedding a metal plate in the compound at the level where its maximum wear is reached. At this point the metal plate is exposed and contacts the brake disc, creating a high pitched squeal. Effective, if a little crude. The first brake pad wear ‘sensors’ (rather than indicators) appeared in the 1970s and consisted of a loop of wire with a low current passing through it. As the brake pad wears past an acceptable level, the sensor loop is exposed and contacts the brake disc. 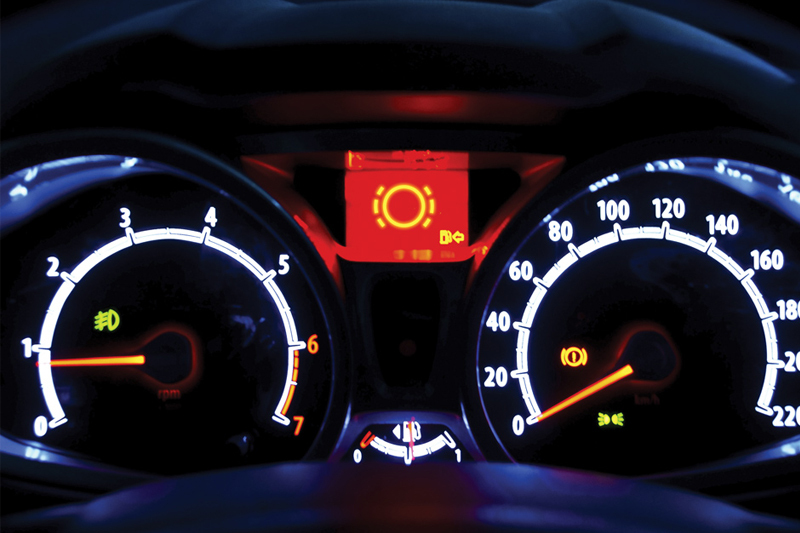 This creates an open circuit and a warning light is illuminated to alert the driver. 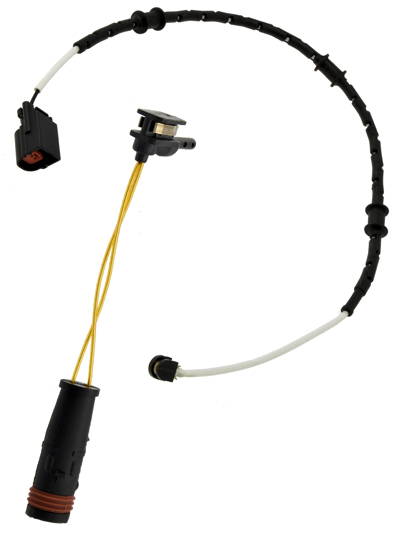 These basic sensors, however, were prone to failure caused by damage or corrosion and their replacement sometimes avoided by simply splicing the two wires together, leaving the driver with no indication of brake wear. Today, the most advanced brake pad wear sensors are incorporated into German marques like BMW and Mercedes. These two-stage sensors have two parallel resistor circuits – one at a higher level and the second at the lowest acceptable level. Resistance in the sensor increases when the first circuit is breached and becomes an open circuit when the second is broken. By working in conjunction with the first circuit of the brake pad wear sensor and considering wheel speed, brake pressure and temperature information, as well as the distance already covered by the pads, the vehicle’s DSC (dynamic stability control) module calculates the estimated lifespan of brake pads and predicts a replacement interval. This is often displayed to the driver via the car’s information system. Due to the importance of their reliability and accuracy, brake pad wear sensors should be inspected regularly and changed if there are any signs of damage to the clips or wiring. They should also be replaced as a matter of course, every time the brake pads are changed. Unlike single stage sensors, there is no ‘cheat’ to avoid replacing a two- stage sensor and, as they are a relatively inexpensive component, it makes perfect sense to replace them whilst work is carried out on the vehicle’s brakes. On completion of the pad/sensor replacement, technicians need to remember to reset the brake life service indicator before undertaking a test drive. Through its rapidly expanding VXPRO range, ELTA Automotive offers a comprehensive range of brake wear sensors that are naturally designed and engineered to meet the specific demands of aftermarket professionals for original equipment matching performance.